Above is my new mantra. And you’ll see in the following post why it feels so appropriate. Okay, so, yesterday, I set myself 3 goals, 3 promises that I would make my best efforts to keep at least for this week and hopefully hereon after. The third, to post here at least every second day, I have already taken care of, because as you can see, I am here! The first, to take all of my supplements, I jumped up and took care of not more than 5 minutes ago, when I took my second and final supplement for the day – and I admit it was because posting here reminded me – proving goal 3 works! The second, to ensure that I consume more than 60g of protein per day (the dietician recommended between 60g-120g) I not only achieved, but BLITZED – I managed to eat 85g of protein today! And I could not have done it without the help of a couple of amazing resources. The first is the myfitnesspal app that I use to track food intake on my iPhone and iPad, however you can also track on the myfitnesspal.com website, and they also have an android, blackberry and windows phone app. You can use it to track all of your food and nutrients, daily exercise and fluid intake. Plus, by putting in your measurements and goals, it also gives you a customised plan and sets your calorie and nutrient targets for each day. Best of all, it is absolutely FREE! I can’t tell you enough how great this app is. The second, is a blog written by Gastric Bypass veteran and expert, Shelly, at “The World According to Eggface”. Here I have found numerous eating plans, recipes and tips and tricks from someone who has been where I am and living it. I believe her page isn’t just for those who have had bariatric surgery, her recipes, ideas and meals are healthy and appetising to anyone. She also has a current giveaway that as a GB newbie I would absolutely love, so please go and take a quick look at her blog – you will not be disappointed. Breakfast : Banananilla Protein Shake = 1 small banana, 1 scoop of vanilla protein shake, 200ml water and ice. Blend. I can’t believe I never thought to make my protein shakes more interesting! Lunch : Seafood salad mix chopped up fine with a tablespoon of lemon and dill mayonnaise seafood dressing. DELICIOUS. 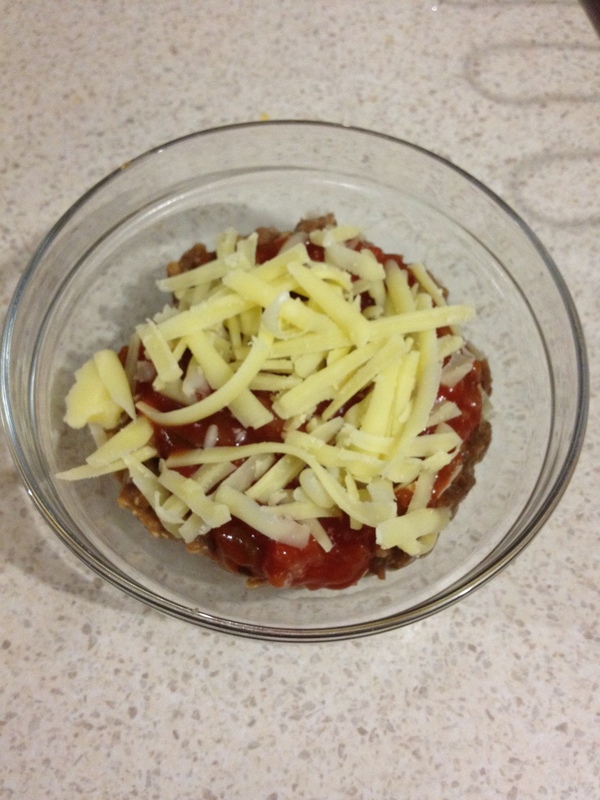 Dinner : Nachos…. sans chips = I fried some mince beef with a little olive oil, onion and garlic. Added refried beans. Topped with salsa and melted cheese. OHMAHGAHD. Who knew pureed food could taste so good?! Who said nachos need chips? All of this possible on a uni day, might I add – an excuse I would have used in my *former* life for not being organised. The meal was quick and healthy enough for my children and husband to also eat, except modified with homemade tortilla chips. 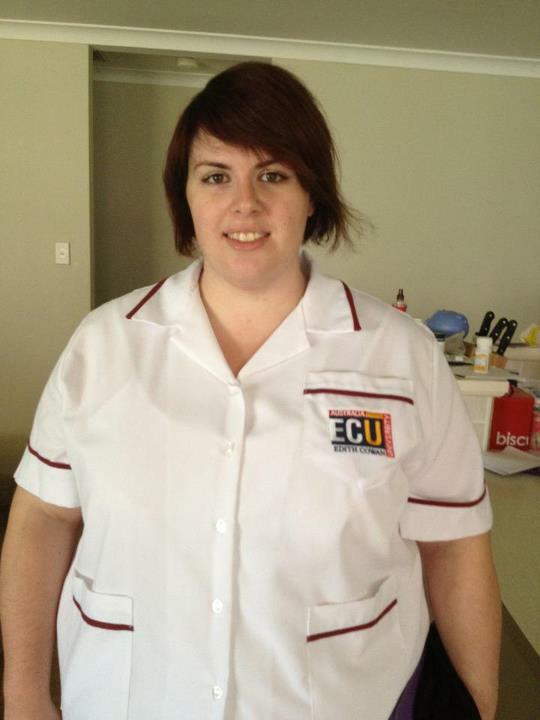 Oh, and as it was a uni day, I’ll leave you with a picture of my new student nurse uniform – I had to alter it myself with my beginner sewing machine skills a week after surgery, in order to accommodate my big swollen belly. I hope to use those beginner sewing machine skills to put the pleat back into it. Haha. Finally feeling clinical and on my way to being a nurse!